Momentum student teams were tasked with using virtual reality to deliver educational content. Editor’s Note: Biology PhD student Sarah Bricault wrote the following account the 2018 Momentum competition, the culmination of an interdisciplinary design class offered during IAP. 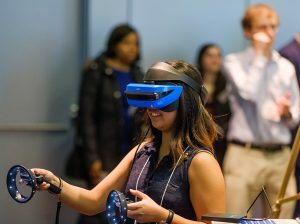 This year, through a special partnership with Microsoft, 35 undergraduate Momentum students experimented with mixed reality to improve, enhance, and discover novel ways to deliver educational content. Marc Graham PhD ’06 was the lead instructor, assisted by Bricault and four other graduate student teaching assistants. Staff from the Office of Minority Education coordinated logistics for the class. It’s the day of competition. To my right, there’s a student putting out virtual fires with a virtual fire extinguisher. To my left, Christmas carols echo as a student revs her virtual engine on the ice level of a driving simulator. Across the room, someone is fighting the labyrinth’s Minotaur in an epic recreation of the Theseus myth. All of these projects, and more, were created as part of Momentum, course 16.682, which challenges first and second year undergraduates to develop solutions to a central problem. Each year, there is a different problem to tackle. This year, the challenge was virtual. Students were tasked with creating a 10-minute educational demo using virtual reality (VR). It’s an incredibly open-ended prompt, and the student solutions were correspondingly unique and unexpected! These students came prepared to stand before industry representatives and the MIT community to proudly present how far they’ve come in just 24 days. In just a few minutes, the judges will emerge to experience the student creations. The air is thick with anticipation. Presentations are rehearsed, jackets are straightened, and of course each demo is carefully calibrated. I wrote the preceding description on February 1, 2018—the day of the yearly Momentum competition event. Judges from MIT and industry were able to experience the students’ virtual reality demos while the audience watched in awe. Of course, there were small technical glitches here and there, but overall the event was a resounding success. Each team’s solution highlighted a unique way in which virtual reality can help augment or shape education. Winners were selected by the judges in three different categories: implementation, creativity, and technical complexity. Implementation: The most spectacularly implemented, easy-to-use virtual program came from Team Holo. From dodging animals on the road to learning how to maneuver on ice, this team clearly demonstrated how a driving simulator could help drivers learn to handle dangerous situations. Creativity: The judges were truly impressed by Team Bubintum. Their simply designed, storybook-style program was created to help children with Autism Spectrum Disorder improve their verbal skills. The team’s in-depth research and innovative application of VR technology won them the creativity award! Technical Complexity: In Team VRoomVRoom’s demo, you become a water droplet and experience the water cycle first hand. Their seamless execution of complex water effects and gorgeous scenery really put this team over the top. The judges not only honored Team VRoomVRoom with the Technical Complexity award, but also crowned them the overall winners of the Momentum 2018 competition! I’ve been with Momentum for three years now as a teaching assistant. Though it’s always an amazing experience, I have to say that this year outshone the others in one fundamental way: variety. The challenge this year was open-ended and the students took full advantage of that creative freedom. And to think these students are all just starting on their MIT adventure! You see, there’s a reason Momentum is only offered to first and second year undergraduates. It’s a class designed to take students from zero to a fully functioning project in less than a month. It’s designed to educate in so many ways—from formal lectures on design, to informal lessons on programming, to the kind of expertise that can only come from troubleshooting that elusive bug in your code. For many of these students, it was their first exposure to project-based learning, and the extent of growth we saw in the teams was astounding. Some of the students walk away from Momentum with internship offers or medals, but all of them leave with a great sense of accomplishment.